Guys, I found something really cool and I just had to share it with you all. I found this cool website called ThinkGeek. It has merchandise from various different things such as books, movies, and of course, video games. They have a category for Pokemon, Minecraft, Mario, Zelda, and much more. They sell a wide variety of items such as shirts and jackets, collectibles, cookie cutters, bags, jewelry, lamps, rugs, mugs, pc gaming accessories, and so much more! I have yet to buy anything from the site (I said “yet”) so I have no idea how good quality it is, but it looks pretty good. The prices aren’t that bad, either, I have to admit. Also, they have stuff on that website that I haven’t seen anywhere else, which is cool. It’s like a whole new world. Definitely check it out if you get the chance. I plan on working on my wishlist in prep for my birthday… Which is about eight months away. But, it’s never too early to start. 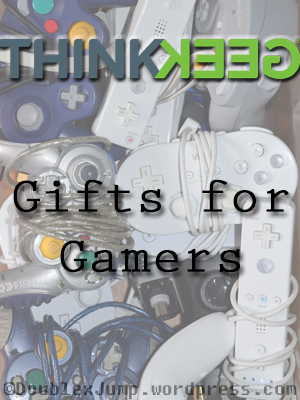 Have you heard of ThinkGeek? Did you ever get anything from there? Let me know in the comments below!